THE SINISTER CELLAR starring Jake The Bird from Espresso Animation on Vimeo. Well, here you go! Feast your senses on this little gem. Presently it is doing the rounds at festivals anywhere, possibly near you. 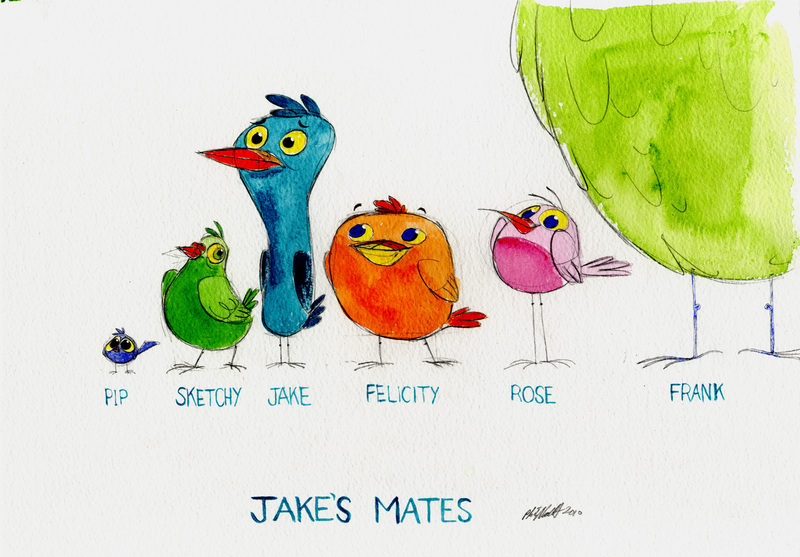 A couple of years ago I did a small watercolour sketch of a little bird character called Jake, with some of his birdy mates. This eventually spurned the desire to model him up in Maya, just to do a walk cycle or extended test one day. Along came Sarah Sutter into the studio to help out with some pitch work and production work, back in 2011, and we arranged to tackle Jake bit by bit in our production down time. While Sarah got to work building Jake from scratch in Maya, following a pile of model study drawings, I started a script and board that wouldn’t be too complex. After the usual production progression of scripts, boards, recording, editing, animatics, re-recording, re-editing and all manner of 3D, modelling, rigging, texturing, blocking, animating, animating, re-animating, re-animating, rendering, re-rendering, then compositing and final editing, final final final rendering to video, we finished The Sinister Cellar early August 2012. Voices and music talent are largely friends and family... All excellent! Hope you enjoy Jake The Bird’s first outing. We had a very good time making this short.